A new study from researchers at Caltech details the collapse of rapidly rotating supermassive stars that formed in the early Universe. The study shows that tiny perturbations cause these stars to deviate into non-axisymmetric shapes during the collapse, leading to the formation of a system of two high-spin supermassive black holes that inspiral and merge. Black holes—massive objects in space with gravitational forces so strong that not even light can escape them—come in a variety of sizes. On the smaller end of the scale are the stellar-mass black holes that are formed during the deaths of stars. At the larger end are supermassive black holes, which contain up to one billion times the mass of our sun. Over billions of years, small black holes can slowly grow into the supermassive variety by taking on mass from their surroundings and also by merging with other black holes. But this slow process can’t explain the problem of supermassive black holes existing in the early universe—such black holes would have formed less than one billion years after the Big Bang. Now new findings by researchers at the California Institute of Technology (Caltech) may help to test a model that solves this problem. Certain models of supermassive black hole growth invoke the presence of “seed” black holes that result from the deaths of very early stars. These seed black holes gain mass and increase in size by picking up the materials around them—a process called accretion—or by merging with other black holes. “But in these previous models, there was simply not enough time for any black hole to reach a supermassive scale so soon after the birth of the universe,” says Christian Reisswig, NASA Einstein Postdoctoral Fellow in Astrophysics at Caltech and the lead author of the study. “The growth of black holes to supermassive scales in the young universe seems only possible if the ‘seed’ mass of the collapsing object was already sufficiently large,” he says. To investigate the origins of young supermassive black holes, Reisswig, in collaboration with Christian Ott, assistant professor of theoretical astrophysics, and their colleagues turned to a model involving supermassive stars. These giant, rather exotic stars are hypothesized to have existed for just a brief time in the early universe. Unlike ordinary stars, supermassive stars are stabilized against gravity mostly by their own photon radiation. In a very massive star, photon radiation—the outward flux of photons that is generated due to the star’s very high interior temperatures—pushes gas from the star outward in opposition to the gravitational force that pulls the gas back in. When the two forces are equal, this balance is called hydrostatic equilibrium. During its life, a supermassive star slowly cools due to energy loss through the emission of photon radiation. As the star cools, it becomes more compact, and its central density slowly increases. This process lasts for a couple of million years until the star has reached sufficient compactness for gravitational instability to set in and for the star to start collapsing gravitationally, Reisswig says. Previous studies predicted that when supermassive stars collapse, they maintain a spherical shape that possibly becomes flattened due to rapid rotation. This shape is called an axisymmetric configuration. Incorporating the fact that very rapidly spinning stars are prone to tiny perturbations, Reisswig and his colleagues predicted that these perturbations could cause the stars to deviate into non-axisymmetric shapes during the collapse. Such initially tiny perturbations would grow rapidly, ultimately causing the gas inside the collapsing star to clump and to form high-density fragments. 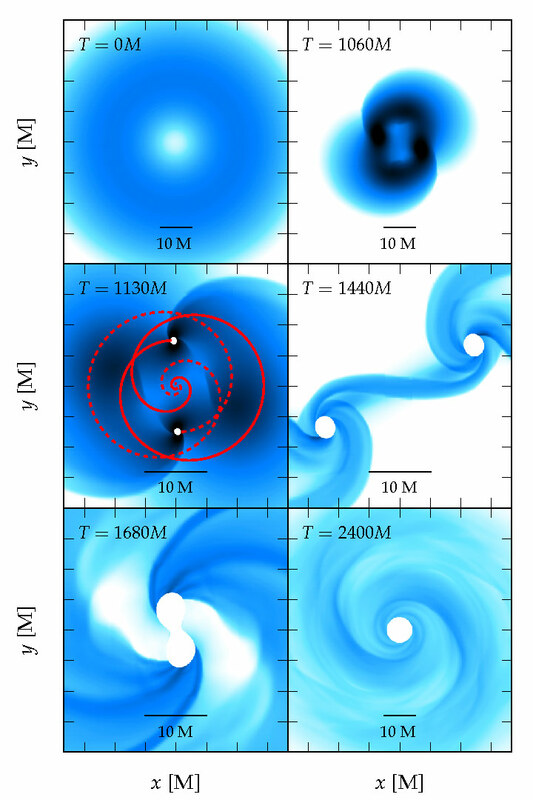 Collapse of a rapidly differentially rotating supermassive star with a tiny initial m=2 density perturbation. The star is unstable to the non-axisymmetric m=2 mode, collapses, and forms two black holes. The nascent black holes subsequently inspiral and merge under the emission of powerful gravitational radiation. The collapse is accelerated by a ~0.25% reduction in the adiabatic index Gamma, motivated by electron-positron pair production at high temperatures. Simulation & Visualization by Christian Reisswig (Caltech). Reisswig and his colleagues used supercomputers to simulate a supermassive star that is on the verge of collapse. The simulation was visualized with a video made by combining millions of points representing numerical data about density, gravitational fields, and other properties of the gases that make up the collapsing stars. Although the study involved computer simulations and is thus purely theoretical, in practice, the formation and merger of pairs of black holes can give rise to tremendously powerful gravitational radiation—ripples in the fabric of space and time, traveling at the speed of light—that is likely to be visible at the edge of our universe, Reisswig says. Ground-based observatories such as the Laser Interferometer Gravitational-Wave Observatory (LIGO), comanaged by Caltech, are searching for signs of this gravitational radiation, which was first predicted by Albert Einstein in his general theory of relativity; future space-borne gravitational-wave observatories, Reisswig says, will be necessary to detect the types of gravitational waves that would confirm these recent findings. Ott says that these findings will have important implications for cosmology. “The emitted gravitational-wave signal and its potential detection will inform researchers about the formation process of the first supermassive black holes in the still very young universe, and may settle some—and raise new—important questions on the history of our universe,” he says. These findings were published in Physical Review Letters the week of October 11 in a paper titled “Formation and Coalescence of Cosmological Supermassive-Black-Hole Binaries in Supermassive-Star Collapse.” Caltech coauthors authors on the study include Ernazar Abdikamalov, Roland Haas, Philipp Mösta. Another coauthor on the study, Erik Schnetter, is at the Perimeter Institute for Theoretical Physics in Canada. The work was funded by the National Science Foundation, NASA, the Alfred P. Sloan Foundation, and the Sherman Fairchild Foundation. 1 Comment on "New Model Shows How a Collapsing Star Results in Two Black Holes that Form and Fuse"
Black hole formation is rather deviated along two phase plane merger as red matter and dark matter collapse out of magneto dominating diamagnetic and paramagnetic material merging to form black-hole has to be verified under symmetrical merging.Blackhole forming a charged one of positive and negative under electron left out merging with proton is also is possible .Under certain conditions a 5 point condensation projecting a quasar is also possible with many myriads of possibilities.Any way accumulation of diamagnetic,para magnetic anti ferromagnetic combinations may have to be dealt with the evolution of such a system.